Since Chinese Medicine is used as the foundation for Medical Qigong Sessions, you may ask, "what is Chinese Medicine?" To give a brief summary, it is an ancient form of medicine, that actually pre-dates written history, with the first written records occurring in 1766 BC during the Shang Dynasty. In other words, it has been around a LONG time! The modalities it includes are acupuncture, herbal medicine, massage (tui na), dietary therapy. and qigong. It focuses on the idea that our body's vital energy (Qi) circulates through channels (meridians) that connect with the organs and bodily functions. There are 12 primary meridians in the body (among other non-primary meridians), creating a vast network of energy pathways, linking everything in the body. 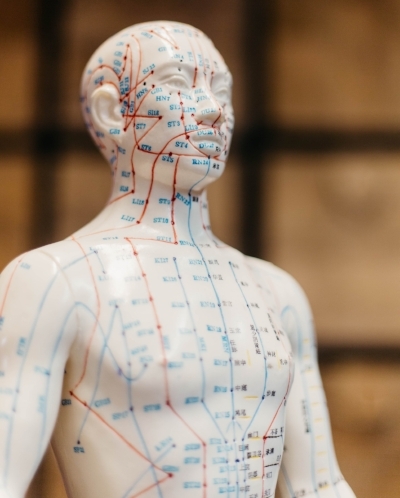 Along the meridians are acupuncture (or acupressure) points that relate to specific organs, areas, or body systems. Large Intestine - elimination of waste, assists the Lung, the process of "letting go"
Based on the symptoms of the client, certain meridians are chosen based on the Five Element System. There are other systems of classification, but I will be focusing only on the Five Element System in this post. Each Element is connected to a different Organ System in the body. The Organ System does not necessarily refer to the physical organ itself, but a network of physiological/psychological functions. These Elements and Organs relate to each other by utilizing 4 different cycles. The first cycle is called the Generating Cycle, where each element is generated by the element before it. For the sake of simplicity, I will leave out the other 4 cycles (perfect material for a future post!). Wood generates Fire --> Fire generates Earth --> Earth generates Metal --> Metal generates Water --> Water generates Wood --> and back again. We can make sense of this system in that we know that wood feeds a Fire and makes the Fire burn. The ash from a fire creates the soil of the Earth. The Earth contains minerals, from which Metal can be mined. When Metal is heated and cooled, condensation forming Water is created. Water promotes the growth of trees, supporting the growth of Wood. From here, the Organ System is added, and we can see the relationship between the different Organ Networks. Wood/Liver supports the Heart/Fire --> Heart/Fire supports the Spleen/Earth --> Spleen/Earth supports the Lung/Metal --> Lung/Metal supports the Kidney/Water --> Kidney/Water supports Liver/Wood --> and back again. If one Organ does not properly support the other, imbalance occurs, sometimes resulting in illness. So for example, if the Kidneys (Water element) are deficient and not adequately nourishing the Liver (Wood element), the Liver can become dry and/or hot. Liver heat is a very common occurrence in our society, responsible for problems such as high blood pressure, anger, irritability, headaches, red face, joint issues, and menstrual irregularities. You could essentially define stress as Liver heat or Liver stagnation. Liver stagnation occurs, when the Liver energy is no longer able to move freely from lack of support from the Kidney (or Water element). If a tree is not watered adequately, it can't grow, expand, and move as it would like. Another example: If the Spleen (Earth element) is deficient, maybe due to poor diet, the Lung (Metal element) will not be fully supported, resulting in lower immunity, that can lead to colds, flus, and other illnesses. There is a lot of more information on Chinese Medicine, but I hope that this serves as a short overview. I look forward to creating future posts that go into more detail!